Canada's Jeff Symonds looks to be struggling - but Jason Shortis says that is just his unique running style., He is about to run into the finish straight - here he comes. The Asia-Pacific IRONMAN Champion for 2015 here in Melbourne is Jeff Symonds in a provisional 8:04.28. "This is unbelieveable. Thanks to those who helped me train here. It's great to win here and to have my family here watching is great," said an elated winner. "For all the youngsters watching - I grew up in an IRONMAN town watching this. So I challenge every youngster to dream big." Out on the women's course Mel Hauschildt has blisters - not cramp. She is running more freely but only 1m ahead of Steffen while van Vlerken has edged ahead of Annabel Luxford for third. Aussie Tim Berkel has finished second - his best effort in the IRONMAN Asia-Pacific Championship. 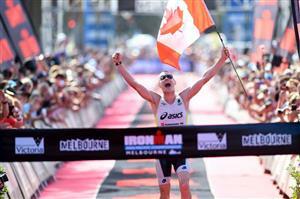 Brad Kahlefeldt comes home in third in his first IRONMAN - great achievement. So Aussies second and third. "What a way to make a living," said Berkel. "I have never hurt so much out there. I am stuffed." On the women's course Hauschildt is now running more freely and running faster than Steffen in second. Fourth home is Germany's Christian Kramer. Home in fifth is long time leader Nils Frommhold. Melissa Hauschildt has resumed her good pace - the cream has helped those blisters although don't expect she will be out dancing tonight. She is about 500m clear of Caroline Steffen who is not making any inroads now. That cream was a miracle cure for Hauschildt ... she is looking strong again now although that dig uphill has hurt her as she approaches the 35km mark. is there more drama yet in this most dramatic of days? In the women - Hauschild is nearing the 35km mark and her lead has reduced to Steffen and van Vlerken is also closing on both of them. Melissa Hauschildt is through the 35km mark. Caroline Steffen is now 3:08 behind Mel Hauschildt with Yvonne van Vlerken at 4:59 in third through the 35km mark. Annabel Luxford goes through 35kms 8:34 down with Asa Lundstrom in fifth 9:24 behind. There's around 3kms remaining for Melissa Hauschildt and a remarkably dramatic win in Melbourne - while Caroline Steffen digs deep to protect her second placing. Melissa Hauschildt is through the 40km mark on the run - and her second IRONMAN victory from as many starts. Hauschildt is into her final kilometre. Melissa Hauschildt has a significant lead now as Caroline Steffen goes through the 40km mark with a 5m36s advantage. Melissa Hauchildt has two IRONMAN 70.3 World Titles to her credit. 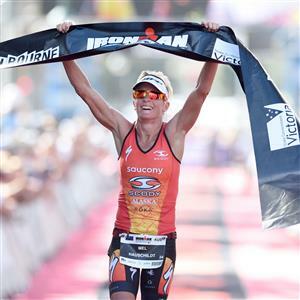 Her sole IRONMAN start was a victory at Port Macquarie. And her second is a huge win - one of the five biggest regional championships on the globe - Melissa Hauschildt is now the Asia-Pacific Champion here in Melbourne. her winning time is 8:52.50. "That was one tough race. I got blisters on the feet at 12kms and at 30kms was walking. I got Vasolene on my feet that didn't help at all," Hauschildt said. "I was in so much pain at 30kms. This is fantastic. It seems like everyone knows you here - it is an awesome feeling." Caroline Steffen is through 41kms and about to come down the finish chute nearly 6 minutes back with Yvonne van Vlerken less than a minute behind her. Van Vlerken is 200m behind with 400m to go. It's now 100m and she is hauling it. Steffen is on the finish line and barely running - she nearly fell. And Yvonne van Vlerken will go past her. Van Vlerken gets second and Caroline Steffen is limping home in third. Oh the drama. and the world of pain that is IRONMAN. Western Australian 40-year-old Sam Hume is the fastest age grouper in 8:39:03 to be 14th fastest overall. He pipped Victoria's Damien Angus (40-44) in a reversal of last year's battle between the pair.